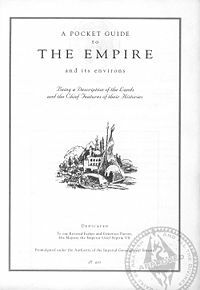 A Pocket Guide to The Empire and its Environs (Being a Description of the Lands and the Chief Features of their Histories) (commonly shortened to Pocket Guide to the Empire: 3rd Edition or PGE3) was part of the Collector's Edition package for TES IV: Oblivion. It was a rewritten version of the Pocket Guide to the Empire: 1st Edition that had shipped eight years earlier with TESA: Redguard, but while the old version had been stridently pro-Imperial in its tone, the new version was much more even-handed and less propagandist. The book opens with a history of the guide itself, before devoting sections to the universe, Oblivion, Aetherius, birthsigns and History. There are then detailed sections on each of the provinces of Tamriel, which take up the vast majority of the book, before a final section on Other Lands, that briefly describes Thras, Pyandonea, Akavir, Yokuda, Aldmeris, and Atmora. The guide can be read in full here. This page was last modified on 18 August 2018, at 03:11.